We recently added support for XEM, the token that powers the NEM (New Economy Movement) network. You can install your NEM wallet on your desktop computer or you can use a mobile device to store your XEM funds. Both platforms are equally easy to set up and use. However, the mobile version of the NEM mobile client might be a better choice if you intend to spend or exchange XEM when you're out and about. The setup of the mobile wallet is at the bottom of this article. Here's everything you need to know about how to set up an NEM Nano wallet use it to buy XEM through Vimba. Before you set up your NEM Nano wallet, you should know that backing up your wallet information is extremely important. We strongly recommend that you make both a paper backup and a digital backup of your NEM wallet. You will be shown a private key during the wallet installation process. You should write down this key on paper and keep it in a secure location. 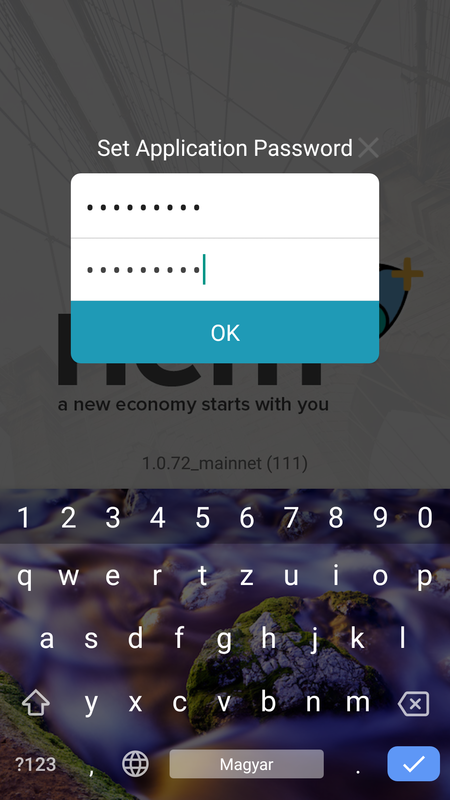 You can also make a digital backup of your NEM wallet by creating a .wlt file. Instructions that explain how to do this are provided below. Here's a look at everything you need to do to install the universal version of the NEM Nano Wallet client. To install the universal desktop version of the NEM wallet, go to https://nem.io/downloads/ and click Universal Client w/ Trezor Support. This is what the universal desktop version of NEM looks like. Click the Sign Up link on the top right side of the screen to continue. Now you should see a warning message that advises you to disconnect your machine from the internet before you create your wallet and when you're backing up your data. Click Ready when you're prepared to proceed to the next step. Pick Mainnet from the Select a network drop-down box. 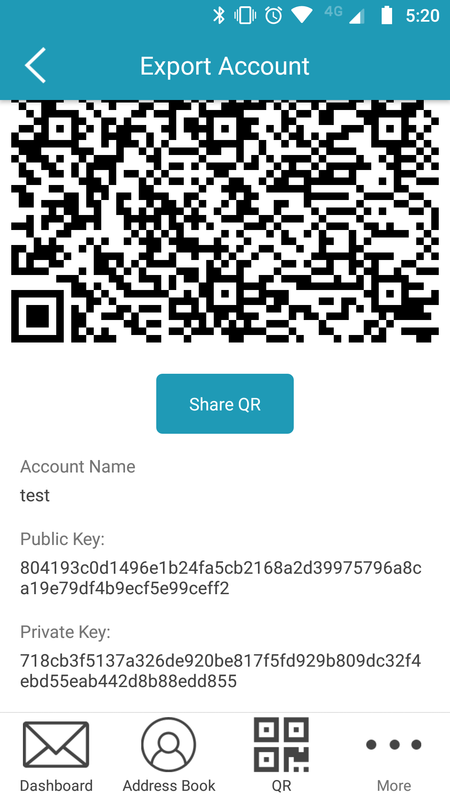 Create a name for your simple wallet and enter a password. Moving your mouse around here will attach random information to your wallet, thus improving its entropy. (In cryptography, entropy is a measure of true randomness.) Move your mouse around the screen until the green bar reaches the 100% mark. The account safety message is a reminder to back up your wallet to avoid data loss. As mentioned above, we highly recommend that you make both a digital and paper backup of your NEM wallet. Click Understood to proceed. Click Download wallet to download a .wlt file, which you can use to restore your NEM wallet's data. Be sure to keep your .wlt file in a safe and secure place. Congratulations! You now have an NEM address, which you can use to buy XEM through Vimba. Log into Vimba, click Buy/Sell and select Xem. A blue Add your address button will appear. 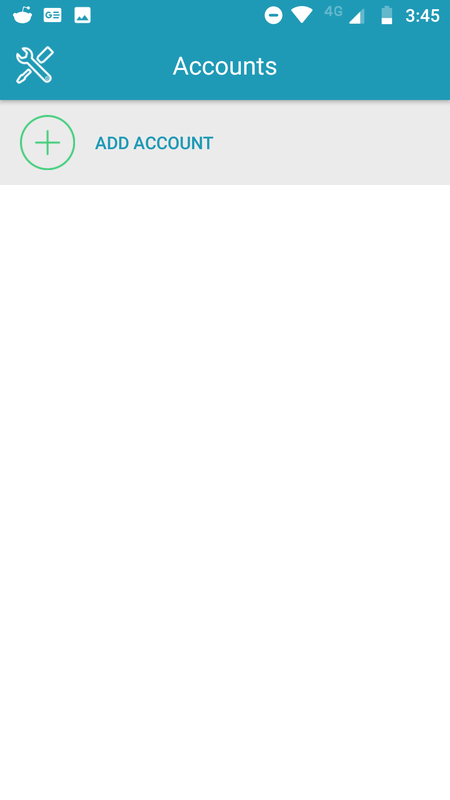 Scroll down to Delivery Addresses and click the Update Address button. 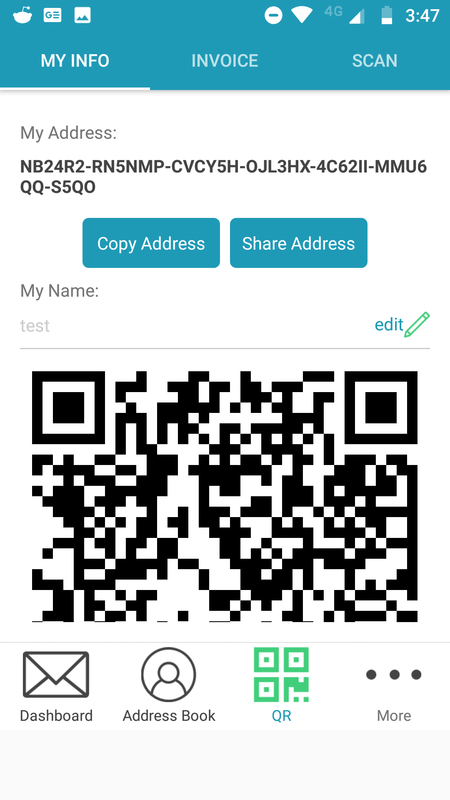 Paste your new XEM address into the blank. You should get an email from us to confirm that it was you that made the update. After you click the link in the email, the rest of the purchase process is easy. Just type in the amount you want to buy and our payment processor Poli will take care of the rest of the rest. After the purchase is finalized, your XEM funds will land in your NEM wallet. The mobile version of NEM Nano Wallet comes in two different flavors: Android and iOS. Keep in mind, however, that the Android version is currently in beta. You can either search for NEM in the app store of your choice or click follow the link from the downloads section of NEM's official site. 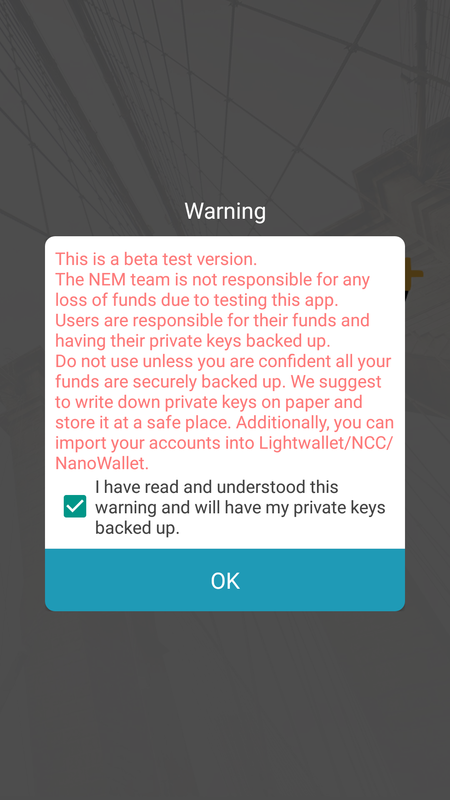 The first thing you'll encounter when you open NEM for Android is a warning message that the app is still in beta. Check box and then click OK to continue. Click the Add Account button to create a new NEM wallet. Next, give your wallet a unique name. You'll now have an XEM address, which you can use to buy XEM through Vimba. 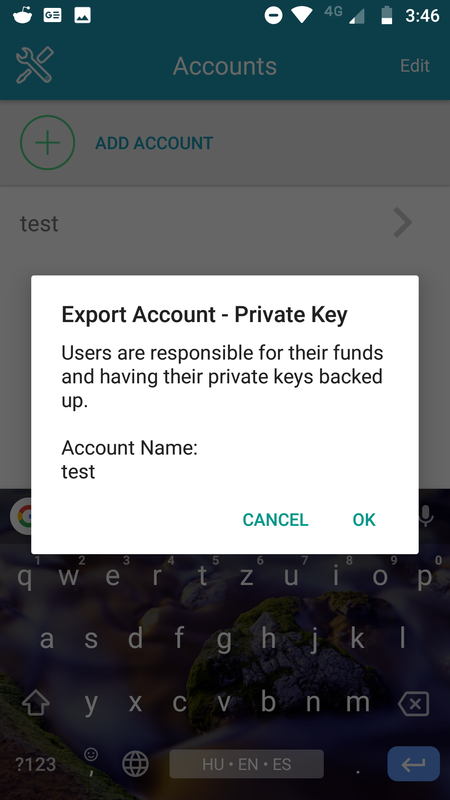 Click More from the main screen, then Export Account, then Show Private Key. We strongly recommend that you keep not only a secure digital copy of your public and private keys, but also a hard copy as well. Go the the Vimba website and log into your account. Then, click Buy/Sell and choose Xem. Click the blue Add your address button. Under Delivery Addresses, you'll see XEM Address. Click the Update Address button to the right of it. Now all you have to do is copy and paste your XEM address into the blank. After you do that, you'll get a confirmation email. Click the link in the email to verify that it's you that made the change. From there, all you'll have to do when you want to buy XEM is type in the amount you want and use our wizard to complete the rest of the process. Contact our support desk via the live chat icon on the bottom right part of the screen, or fill out this form and we'll get in touch through email. 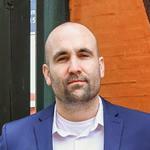 How do I add an Ethereum wallet address to my account?